At the Curiosity Approach, we promote curiosity, investigation and discovery. For children to be CURIOUS about the world around them, following their own unique style of learning and to be engaged in the joy of DOING rather than the end result. Too often at this festive time of year, we feel under pressure to create products for the children to take home, cards, presents and calendars. If WE feel this PRESSURE to get these products complete, spare a moment for the little ones who are sadly on a conveyer belt of activities of handprints and paper plates or as I like to call them “craptivaties”. Quite often there has been heated debates and controversy regarding the subject and if I’m honest, I previously worked in a setting that readily provided activities of a product nature, manufacturing 50 odd parent Christmas cards all vanilla and bland in personality and style. 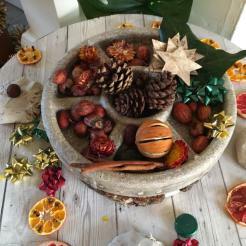 However, over time my thinking has changed and I have become to see an alternative to the production line of crafts which we replicate during this festive period. Please before anyone gets on their high horse and starts chomping at the bit to retaliate before I’ve even started. There is a time and a place for everything, just like baking a cake (product) where we are following a recipe book to make a copy of the one depicted in the photograph. However for the baker, it is the joy of the baking that inspires them most. 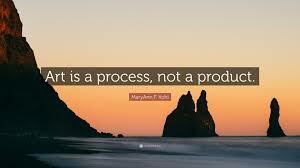 Therefore I just wanted us to remember at this time of year, to think about process v product. The Christmas season is so very rushed and hurried we are missing vital opportunities to enjoy experiences, too busy looking to tomorrow or next week, desperate to get things complete, in preparation for the big day. Sadly forgetting that our children live in the moment and become immersed in the process at hand. 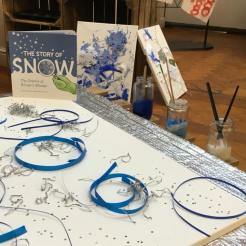 What learning outcome do children get from these products, the paper-plate snowmen with perfectly positioned buttons guided and glued in place, by the well-meaning adult? The handprint reindeers, robins or Christmas Tree footprint? This may be a controversial subject, with many disagreeing that it’s wonderful for parents to look back on these creations. Looking back on a bygone time, when their little ones hand’s prints were just a memory of the time when they were so very small. As we know children grow up so quickly, so surely, it’s a time to cherish by helping them have experiences that they will look back with fond memories. Creating items that are unique to the individual and not clones, copies or replicas of a design dictated by the adult. That once strung across the classroom all look exactly the same, with no individuality or personality allowed in their creations. Let us capture a moment in time where our children are at their most creative, expressive and have the confidence to create artwork of such beauty and individuality. As we get older we are weighed down by pre-conceived ideas that we cannot draw, paint sing or create. So, at this critical time in our child’s learning, let’s build our children’s self-esteem. Let’s show them we value their creations, their drawings and artwork. Show that we love and respect them enough to allow them to create a card, picture or calendar special enough to give to their loved one. That is UNIQUE to them, created with love and freedom of expression, instead of a directing hand, pointing where to position and stick! Surely as parents, we would much PREFER a piece of artwork lovingly and painstaking created by our child, rather than a replica, copy or imitation of something the educator has DECIDED everyone MUST create. The Educator has already created an example to follow. With a finished product in mind. Educator fixes mistakes or repositions items. All artwork looks the same when complete. With instructions to follow, stick this here and position that there. Set resources are given to the child to use. The whole class creates the same item. A schedule is planned to get them completed, with tick lists and rotas. Children are instructed to complete. Precut circles, shapes for the child to position. Handprints, footprints, cut out by the adult. A conveyer belt of children to complete and take part in. is viewed as a creative journey or process, rather than as a deliverable or end product. There are no samples for children to follow. No step by step directions. No right or wrong way to compete. The artwork is unique to the child, following their own unique learning style, thoughts and ideas. The experience is based on choice. Every piece of artwork is completely unique to the individual child. The experience is the main focus, not the end result. Adults have no input into the direction or creation of the artwork. Entirely the child’s own work. Be spontaneous. Experience the pleasure of self-expression. Enjoy the freedom of interpretation. A sense of CURIOSITY, to make sense of the world through emotion and creativity. It is unique to the artist and cannot be replicated. What are the learning opportunities for the child? Are we stuck in a tradition of creating crafts for the sake of creating them? Do you need to educate your team or parents about stopping product-based activities? Do you need to get OFF the conveyer belt procession of constant Christmas crafts? Allow our youngest children to have the freedom to create their own creations and artwork, in this hurried world where we are led by testing and sadly conforming to pre convived norms or set standards. Allow our children this time to follow their own learning styles, to THINK FOR THEMSELVES. To create artwork which is beautiful and expressive, exquisite enough to adorn any art gallery. Stop pushing them to fit into a box and all conform to produce the EXACT SAME ITEM. Allow our children to be unique, to become immersed in activities where they are lost in the moment. To become deeply engaged, unhurried and rushed. To be curious and inquisitive to explore mediums and resources. 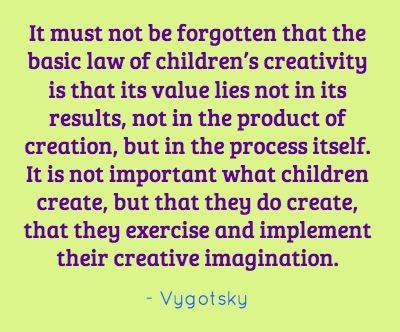 Allow our children TIME to create with love and emotion. Allow our children the opportunity to EXPRESS themselves without direction, comment or judgement. Our children have their own ideas and thinking, let’s not patronize them by underestimating their capabilities to construct and create. Our children are researchers in their own learning and not empty vessels to be filled with our own preconceived ideas or adults thinking. Let’s teach our children through their HEART, mind and body. VALUE their authentic and unique ideas. Respect their individuality. Allow children to be CURIOUS AND EXCITED about the process, to learn at their own pace. The world needs artists more than it needs imitators or copycats, let’s help inspire the thinkers and doers of the future, teaching children HOW TO THINK and NOT what to think! BE CURIOUS, BE BRAVE AND MAKE A DIFFERENCE!